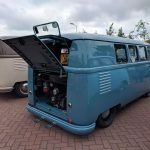 We regularly visit general oldtimer and classic car events as well as aircooled Volkswagen events and meetings since 2002. Below you can find an overview of the events we visited in 2018. Just move your cursor over the photos to go directly to the photo gallery of your favourite event.